Vegetable sagu is a side dish for roti, Poori and dosa. It is a South Indian recipe originally from Karnataka state. Coconut, green chillies and pepper corns are the main ingredients which give spiciness to the curry. 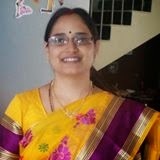 My mother-in-law love to make it with only one vegetable that is Bottle Gourd or Lauki. It is a no onion no garlic curry. It is for those who do not eat onion or garlic on some particular days. She taught me this version, but I have it changed. I have added all other veggies, onions and some garlic. When I was surfing in the net I come across this recipe, where in it was give as taught to me by my MIL. After reading this recipe I also stopped adding garlic and made it as is told my by MIL. Chop all the vegetables into cubes. Heat oil in a pressure cooker; add all the ingredients under ‘For Tempering’. When they start spluttering add onions and fry for a while. Add all other veggies and sauté for a while. Add a cup of water and pressure cook for three whistles. Meanwhile heat a small kadai, add all the ingredients under ‘For SaguMasala’. Fry them till the aroma comes out. Let it cool down completely and grind it to a fine paste. Keep it aside. By this time the veggies in pressure cooker might have cooked and cooled also. Open the cooker lid and slowly pour the sagu masala paste into it. Mix well and let it boil for 2 minutes. 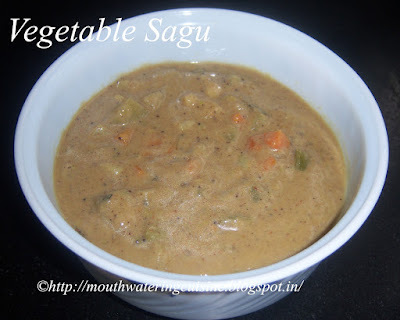 Serve vegetable sagu with roti, poori or with dosa. For more curry recipe click here.